A rapid, one step test for the qualitative detection of Cotinine (nicotine metabolite) in human urine. For Determination of Smoking Status Only. The Nicotine Test Cassette (Urine drug test, CAS-COT test) is a lateral flow immunochromatographic assay for the detection of Cotinine in human urine, with cut-off 200ng/mL. POSITIVE: One red line appears in the control region (C). No line appears in the test region (T). 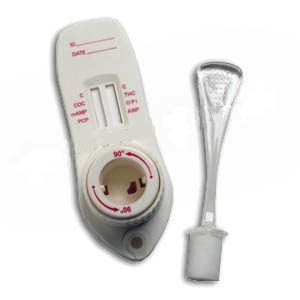 The COT One Step Cotinine Test Device (Urine) is a lateral flow chromatographic immunoassay for the detection of Cotinine in human urine at a cut-off concentration of 200 ng/mL. This test will detect other related compounds, please refer to the Analytical Specificity table in this package insert. This assay provides only a preliminary analytical test result. A more specific alternate chemical method must be used in order to obtain a confirmed analytical result. Gas chromatography and mass spectrometry (GC/MS) is the preferred confirmatory method. Clinical consideration and professional judgment should be applied to any drug of abuse test result, particularly when preliminary positive results are used. Cotinine is the first-stage metabolite of nicotine, a toxic alkaloid that produces stimulation of the autonomic ganglia and central nervous system when in humans. Nicotine is a drug to which virtually every member of a tobacco-smoking society is exposed whether through direct contact or second-hand inhalation. In addition to tobacco, nicotine is also commercially available as the active ingredient in smoking replacement therapies such as nicotine gum, transdermal patches and nasal sprays. In a 24-hour urine, approximately 5% of a nicotine dose is excreted as unchanged drug with 10% as cotinine and 35% as hydroxycotinine; the concentrations of other metabolites are believed to account for less than 5%.